TORONTO - (AP) Jeremy Chardy of France upset countryman Jo-Wilfried Tsonga 6-4, 7-6 (4) on Wednesday at the Rogers Cup. In two previous appearances in the Rogers Cup, Tsonga reached the semifinals. 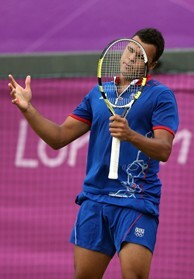 Tsonga was coming off the London Olympics, where he picked up a silver medal in doubles. Chardy is ranked 47th, while Tsonga is ranked sixth.